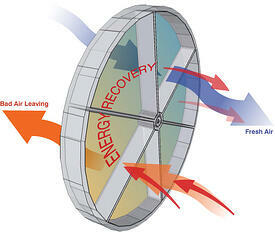 How Do ERV Fresh Air Ventilation Systems Work? Let UltimateAir break down the key aspects of how an ERV works and why obtaining one is so beneficial for your home or business. Energy Recovery Ventilation is connected to the duct work of your HVAC system OR ducted independently to rooms in your home. Equipped with two fans, one fan within the ERV draws fresh air into the building while the other pushes stale air out to ensure that a space is clean and contains fewer pollutants, toxins, allergens, and more. As the two air streams pass through the ERV, the patented heat exchanger within our units transfers both heat and moisture from one air stream to another. In other words, the heat from the exhausted air is transferred to the fresh air entering the building. This ensures that your space retains heat or cold, depending on the season and weather. As outside air enters the ERV, it is also filtered by the heat exchange material rated as a MERV 12 filter to capture contaminants. After passing through the patented dual-purpose heat exchanger, the warmed fresh air is distributed throughout the building. Up to 99% of the heat energy from the stale exhaust air is transferred to the incoming air flow. This process provides incoming fresh air at a temperature extremely close to the temperature already inside the home or business, therefore requiring less energy to condition (warm or cool) the new air. Our superior, high-efficiency ERV is why the UltimateAir ERV is less expensive to own and operate. After you’ve asked, “how does an ERV work?” you’ll likely want to know about all the great benefits you can gain by incorporating one into your home or business. ERVs provide a host of advantages to homeowners and companies, so whether you’re starting work on building a new house, or looking to make improvements to a current property, investing in an ERV is the perfect choice. Find the Perfect ERV for You! Now that you know what an ERV does and how it works, along with all the benefits it can provide, it’s time to begin the hunt for the ideal ERV system for your space. Consult our product page to learn about the premier ERVs that UltimateAir supplies, which are the most efficient units on the market! And be sure to reach out to our dedicated team with any questions you have.